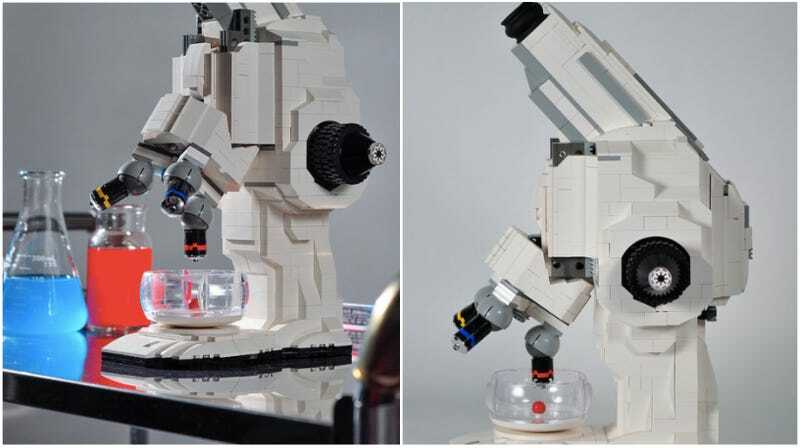 This working Lego microscope was built by Carl Merriman, a Lego artist who's been building for over 27 years. It's sleek, functional and even though you couldn't use it to study Ebola or the T-Virus, it's still a pretty sweet piece of kit. While trying to find a use for the pod itself, I realized that it was very close to a deep petri dish. I used a planetary gear system to allow both coarse and fine adjustment of the objective “lens”. A little more tinkering and I connected the focus to a magnifying glass and fiber optic light in the eyepiece, so adjusting the focus knobs would actually bring the writing on a LEGO stud in and out of focus. UPDATE: Check this microscope out on CUUSOO.